Don't accept a ride from a driver who approaches you in the airport. When you arrive in Paris, you may be approached by guys in the airport asking if you need a taxi; these guys aren't licensed taxi drivers and you should NOT go with them. They may even tell you there's a taxi strike so you think you have no choice; this is almost always a lie (more on this scam here). 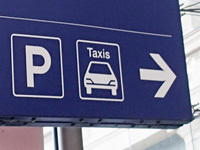 Simply looks for the signs for taxis and follow them. When you get to the legit taxi area, you'll wait in line and an airport employee will assign you a taxi. Your driver may not speak English at all, so it's a good idea to have your hotel address printed out and ready to show him or her. 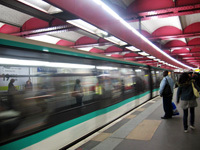 If it turns out there really is a taxi strike, or if you want to save some money, the RER (regional train) is another way to get into Paris from the airport. Finally! After many years of me being mad about this, proper licensed taxis in Paris now accept credit cards. There's no flat fee from CDG airport to Paris; your driver will turn on the meter and you'll pay based on how long your trip is. I usually stay in Montmartre, in the north of Paris, and as of this writing (2015), a taxi ride from CDG airport (which is to the north-east of Paris) costs from 50-60 euros depending on traffic. 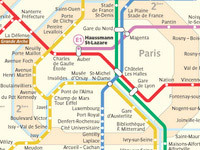 A ride from CDG to the center or south or west of Paris would take longer and therefore cost more. You may be charged a baggage fee of one euro per bag (last time I checked) on top of your normal fare; I thought this sounded like a scam the first time a driver charged me this fee, but it turns out it's legit, and there's probably a sign or decal about it posted in the taxi. You're not required to tip, but I usually tip my driver 5 euros or so. 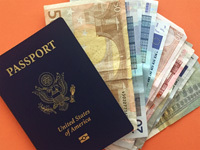 See my article about tipping in Paris here. 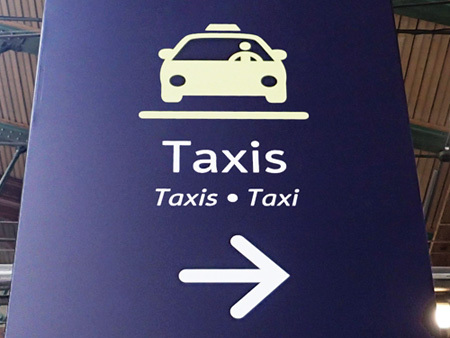 If you're staying a hotel, they can probably call a taxi for you; just ask. If you're at an AirBnB or something similar, you can either locate a taxi stand (figure this out ahead of time, obviously! they're not everywhere) or call a taxi, but of course you might have to speak a tiny bit of French to pull that off. Depending on how well you've gotten to know your AirBnB host, you might be able to have them call for you. Be aware, you can sometimes hail a taxi just anywhere out on the street, but this isn't easy and might take ages. I've done it but I don't recommend it when you're on a tight timeline! Okay, so we've covered the ride from the airport into Paris and back. What about within Paris during your stay? There's not much to this; taxis are everywhere and they're pretty easy to hail; it's definitely easier if you find a taxi stand but they'll also pick you up on the street fairly often. You can hail a taxi just like you would in New York; lean out toward the street and throw your arm up! (I mention this because some other countries have strange, different systems for hailing a cab, like waving your hand downward in a "slow down" motion; weird!) I honestly have no idea if the taxis are allowed to stop for you when you're not at a taxi stand, but they usually will. There's a meter in the taxi and it'll start at a minimum amount, like four euros or so. As I've mentioned, don't expect your driver to speak great English; have your destination address printed out if possible. They usually have GPS and will get you there no problem. The absolute worst time to catch a cab in Paris is right after the Metro has stopped for the night. You can imagine; right around the time the Metro is closing, everyone in the bars is scrambling to settle up and say their goodbyes, and those unlucky ones who miss the last Metro are now all competing for all the taxis in Paris. So, a bit earlier, while the Metro's still running (like 11:30pm), it's easy to get a cab, and then there's about an hour where it's practically impossible, and then it gets a lot easier again. I say, if you're still having a drink around midnight, it's better to take your time and plan to have another and head out around 1:00-1:30am to search for a taxi. Look at it this way; you can either spend that last 45 minutes or so outside trying and failing to get a cab, or you can spend it inside chatting and drinking — either way you get home at the same time! You're not required to tip, but I usually tip the driver a euro for any trip within Paris; maybe two if it's way across town. Again, see my article about tipping in Paris here.